It’s not often that you find a vehicle built in 1949 which until recently has had only one owner. This Dennis Lancet 33 seat coach was acquired new by Safeway Services of South Petherton in Somerset, which was owned and operated by the Gunn family. It was re-registered in 1985 to ASV 900 its previous registration was ETP 184 why it was re-registered I know not. I also shot this interesting sign from inside the coach. In the early part of this year Stephen Morris of Quantock Motors purchased this vehicle from Vernon Gunn. He brought it to the West Midlands to attend a bus rally and not only was I lucky to photograph it, but also to be its only passenger to the rally. The vehicle has since returned to its base in Somerset. Ken’s comments in respect of this magnificent vehicle raise another point. Never mind why the registration change, but why would a Somerset operator buy new a coach registered in Portsmouth? Could it be that the body builder registered it on the owners’ behalf? In those days it would have been remarkably unusual! This Reading (of Portsmouth) – bodied coach — hence the original Portsmouth registration was new to Safeway Services of South Petherton, the domain of the legendary Veronica Gunn. 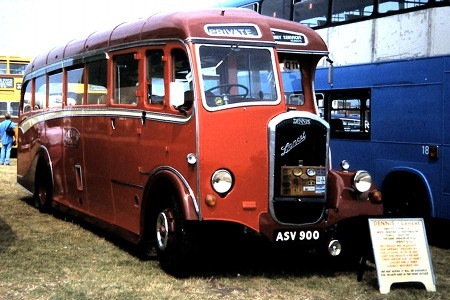 Following withdrawal in 1969 the coach, by then re-registered ASV 900 (did this stand for A Safeway Vehicle? ), was retained in preservation by the company, and it is said that Miss Gunn even used it to go to Buckingham Palace to collect her MBE in 1987! We should be grateful that this coach has survived and within a caring environment, too. It really is in superb condition and a tribute to the coachbuilder, of Portsmouth. Coaches of this era were really the swansong of ‘tween war art deco design. This coach oozes it in spadesfull. 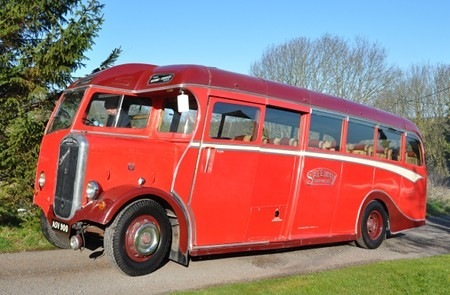 For such a small coachbuilder as Reading & Co., we now have three examples of their craft on the website; The wartime austerity-bodied Provincial AEC Regal/Regent, this one and the 1964 Guernsey Nimbus. The firm lasted longer than I thought, showing that it was not just used for distress purchases. Does anyone have/know of, a history of Readings? I’d love to know more. Incidentally, coachbuilder Portsmouth Aviation was only just down the road from Readings. Quite a number of Reading-bodied coaches were registered in Portsmouth prior to delivery. The same was true of Wadhams at Waterlooville. Many were supplied through Sparshatts, a local agent which acted for a number of chassis manufacturers including Dennis. Sparshatts probably arranged for the vehicles to be bodied as well — a complete service for the small operator! Picture of Portsmouth Aviation bodied half cab can be seen on this site under galleries / BVBG / The Bristols. Here is a quick link to view. Further to the posting of ASV 900, here is a view of the offside, taken at the Southsea rally in June 1990. Thx, folks, for the Reading history information. This lovely old coach is now owned by Quantock Coaches in Taunton. My step dad Vernon Gunn, nephew to Veronica Gunn MBE retired and did not want to just park the vehicle up. It is now still in its colours with Quantock. I know this site deals with old buses but I think what I am saying is relevant. On one of my infrequent visits to Salisbury today I saw 2 new double deckers. Only by looking carefully could I tell that it was a Dennis Enviro 400. Why are manufacturers seeking anonymity? Look at the radiator on the Lancet above, no doubt who made that. The Park and Ride Dennis single deckers are the same although Dennis are proud of their dustcarts- they put their name on them. The Government seem to be realising that we need to make things in this country rather than selling each other dodgy financial products. Paragon, I agree with you absolutely but some operators have been known to remove name badges from vehicles. I remember when Trent in Derby began taking Bristol VR’s, the Chief Engineer at the time ordered the Bristol badges to be removed from the engine covers under the premise ‘I don’t see why we should advertise Bristol products’ Now whatever your views on the Bristol VR may be, I always thought it was a barmy notion! In the caption it is stated that the above vehicle was re-registered from ETP 184 to ASV 900 in 1985. This I find perfectly plausible, and I suggest that the subsequent information that the registration ASV 900 was applied by 1969 is not correct. I am inclined to suppose that the reason for the re-registration is as follows. When paper registration documents (V5) were introduced, any vehicle remaining untaxed for a certain period automatically lost its registration unless it was claimed within a particular time limit. If not claimed, the vehicle had to receive a new registration when it came to be retaxed. I think there has since been some yielding on this point, and that it is now possible for a vehicle’s original registration to be reclaimed. ‘ASV’ is one of many marks used by DVLA (from the early 1980s) to issue to users who wished to have a ‘timeless’ (i.e. non-prefix/suffix) registration and who were prepared to pay for the privilege, or to issue to vehicles which needed to be re-registered for any other reason. (Vehicles dating from 1963 onwards may still have normally received a suffix/prefix registration, I’m not sure now). Kinross-shire County Council (the original issuer of ‘SV’ registrations) was one of several Scottish authorities which did not get so far as issuing three-letter registrations, therefore in the normal course of events ‘ASV’ was not issued. The registration ‘ASV 900’ may or may not have been especially requested. There is also the possibility that the registration ETP 184 was intentionally transferred to another vehicle, although I think this unlikely. ASV marks, according to ‘A History of Motor Vehicle Registration in the UK’ by L. H. Newell (Newby Books, 1999) were issued post-1983, The vehicle in question was taken off the road in 1969, and probably not used again until 1987 when it was refurbished and repainted to convey Miss Gunn to the Palace. So 1985-1987 is I agree the most likely date of re-registration. Can’t say for certain, but It is unlikely ETP 184 was ever transferred. 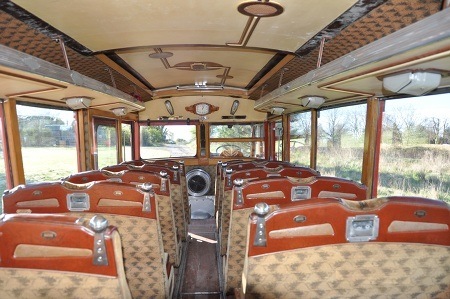 During the course of the last year, the coach was acquired by Go Goodwins of Eccles, and has subsequently been sold on again.